Actress Daphne Maxwell-Reid is arguably best known for being second. Most remember her as Janet Hubert’s replacement in the role of Vivian Banks on the hit TV show The Fresh Prince of Bel-Air. But Maxwell-Reid had groundbreaking firsts as a black woman: the 1969 cover of Glamour magazine, and homecoming queen at the prestigious Northwestern University in Chicago. The Glow Up: Daphne, how did you get discovered? Daphne Maxwell-Reid: My English teacher suggested me for Seventeen magazine my freshman year at Northwestern. That led to meeting Eileen Ford, the legendary owner of Ford Models. At our first meeting, Eileen pinched my upper arm and said, “Lose 5 pounds,” which I did! TGU: Did you get the sense that you were Ford’s “black girl”? DMR: In 1967, agents were trying to find models who were “acceptable” to clients who didn’t really want to book black models. It was the light-skinned models, like Jolie [Jones, music producer Quincy Jones’ eldest daughter] and I, who were considered acceptable. They said, “OK, we can have a black girl because she’s not too black!” But, finally, we got Beverly Johnson, who was dark-skinned and beautiful. TGU: You were a full-time model and a full-time student? DMR: Yes, sir! Right away, I was working for Glamour and Mademoiselle. I didn’t know you couldn’t do both! TGU: Tell me about becoming Northwestern University’s first African-American homecoming queen. DMR: It was uncomfortable. It was unexpected, and it was disrespected. At the time, I promised Northwestern they would never hear from me again. Four Caucasian sorority girls were elected to Homecoming Court, but not as the queen. One of them cried her little eyes out. When they called my name, the president of the university looked at me, held the crown over my head and said, “I have to stand here while they take pictures,” then turned and walked away. Backstage, while the court was introduced, one by one, the girls would go out and you would hear applause from the audience. Then “Daphne” was introduced … silence. So I hiked up my dress, walked across the stage, said, “Thank you,” and went on about my business. At the homecoming football game, they gave me a little cup that didn’t even have my name on it. However, it was a blast. Jet magazine, Amsterdam News and press from all over the world had gotten hold of the story. My community—the black community—celebrated. I wasn’t in the yearbook as homecoming queen because the administration told me it “wasn’t important.” Forty years later, the Black Alumni Association gave me a Hall of Fame Award. The current university president apologized, asked me to crown the new homecoming queen and to join the advisory board. TGU: As a model, what was your best booking ever? 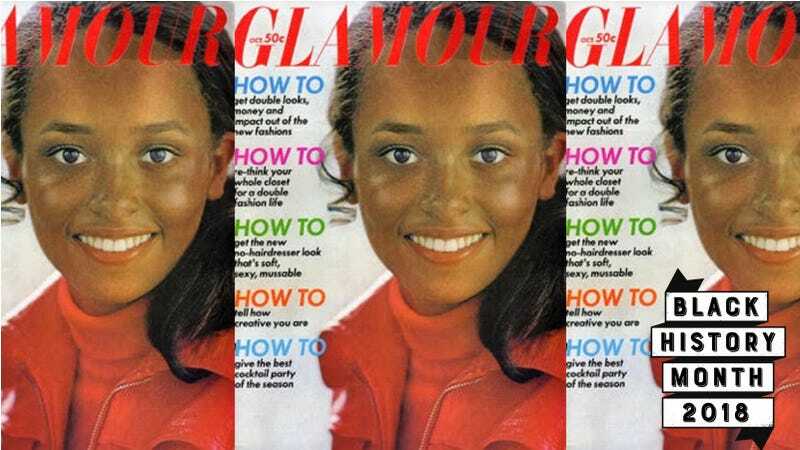 DMR: I was the first black woman on the cover of Glamour! The photographer had me sit on a windowsill and smile. I was done in 15 minutes. A month-and-a-half later, I was walking by a newsstand and saw myself! No one told me that booking was for Glamour or I’d made the cover. It’s my most enduring photo. But there was another shoot that is my favorite. I thought, “Holy cow! I’m in a great bunch!” It was a Ladies Home Journal article: “Fourteen Most Beautiful Women in the World.” I was chosen as one of them. I was floored! It was 1968 or 1969, when Ladies Home Journal was a big magazine. Supermodel Cheryl Tiegs was in that picture. TGU: The path from model to actress seems to have been easy for you. DMR: I was a curious, adventurous woman. I had no qualms about walking through another door. My career and life have been luck, guided by a higher power. TGU: What is the biggest life lesson modeling taught you? DMR: Modeling taught me about self-love, and to separate work from real life. If you don’t get a job or a booking, it is not about you, so don’t be unhappy, because that was not your job. TGU: How have you seen things change in entertainment and fashion? DMR: I have seen that it has become more acceptable to be the person that you are. I have seen the dominant culture open their eyes—or have their eyes opened to—the possibility that there is something else out there they were not aware of, and that was us [black people]. The acceptance of that I have seen go through many changes. When I first started on television, I was one of a few black women who was doing network television. I was blessed—I’m talking divine blessing—to meet the people who made things actually happen, not just talk about “We gonna ... ” do something.